A while back I was fortunate enough to procure a very special item and add it to my millinery collection. It was a handmade headdress by Mallory, owner of brand VoodoooDolly. I was allowed to commission something tailored after one of her one off test runs that I had fallen in love with. During the production time, I got to do a Q and A about her and her works and am happy to share my findings here with you. 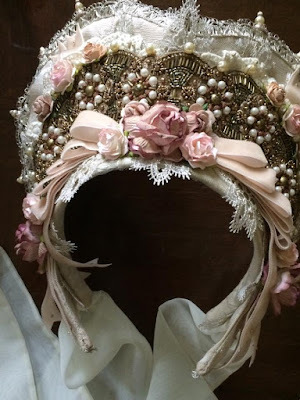 At the end I'll be sharing how my headdress came to be and the finished product. 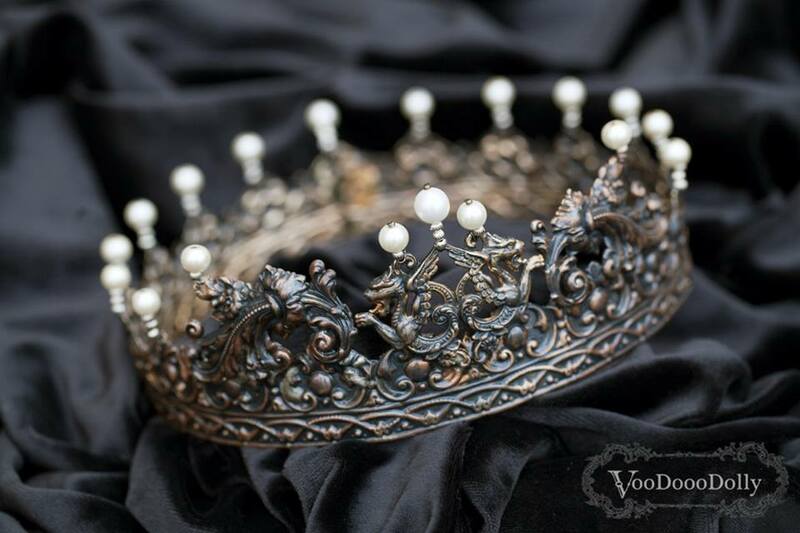 All professional and personal photographs have been so graciously donated by VoodooDolly and I again thank her for all of her time and effort! 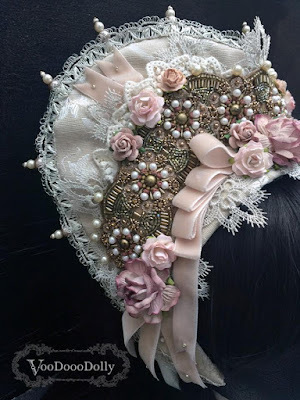 How long have you been into millinery? 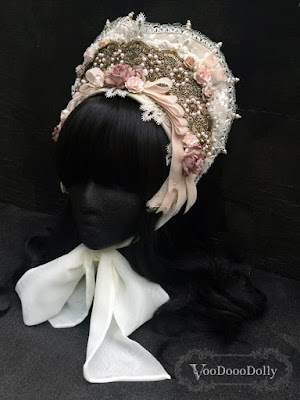 Millinery is actually a bit of a new world for me as far as my artistic endeavors go! I started playing around with buckram and wool felt after a hat making workshop at Dragon con three years ago. 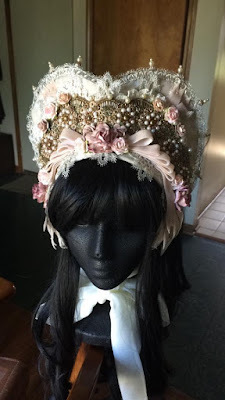 Since then, I’ve used my previous pattern making experience and sewing to play with hats! It was too much fun to not stick with. What inspires you when you think about creating a piece? When creating a piece, I have endless inspirations and thoughts constantly flowing through my mind. Even as the piece begins coming together my inspiration might suddenly change or something else will work so much better than what I had planned. I really let the inspiration come from anywhere! My favorites though are traditional costumes from around the world, and historical headpieces from the Tudor and Elizabethan time periods. 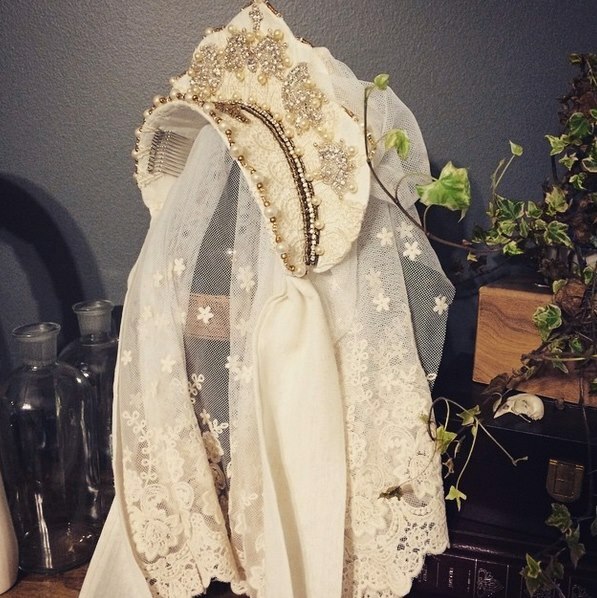 I could look at Russian Kokoshnik headpieces forever and never run out of inspiration! When drafting a piece together is there anything you watch or read to help with the creative process? I often times find myself putting on historical fiction dramas, or any of the Lord of the Rings movies or Harry Potter films. The historical fiction ones are for when I need some beautiful costume inspiration, and the others are pure background noise. Don’t get me wrong, I LOVE lotr and Harry Potter, but I can recite the lines from memory and I think it helps to have a story, but not have to look at the picture on the screen. 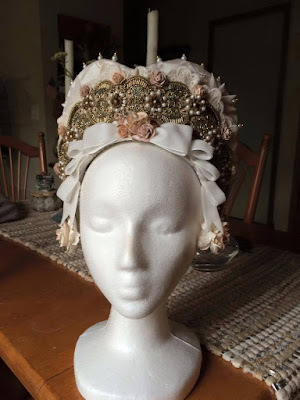 I had a marathon of The Tudors tv series while making my first headdresses and love any show or movie involving Queen Elizabeth I. 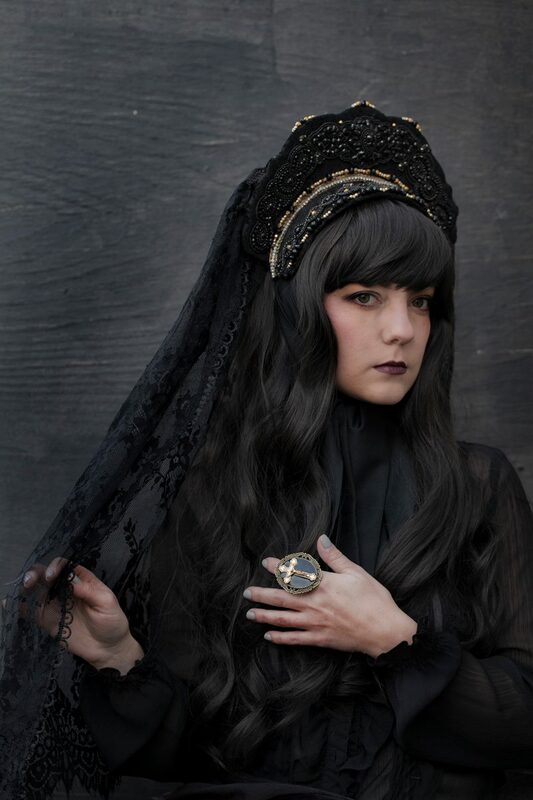 Then there’s Salem and Oulander with its gorgeous dresses… I could go on forever! Are there certain materials that you like working with more than others? There are materials that I like for their versatility more than others, but I often times find myself experimenting with new things. Buckram, millinery wire, interfacing, and (lots of) beads are my go-to items, but that’s just for the basics. If a piece feels like it’s missing something, I’m not afraid to reach out of my comfort zone and try something new- that’s what keeps me going back to make more! So after getting the idea for a particular piece, about how long does it take from beginning to end? It really varies from piece to piece- but assuming I’ve already gathered all the needed materials, I’d say an average of two weeks. I work a full time job during the day, so as soon as I get home I get right to work. The weekends are my big chunk of time when the majority of the magic happens. From the looks of some of the hand beaded tudor style headdresses the intricate beading alone looks pretty intense. What areas do you seem to get the most interest from? 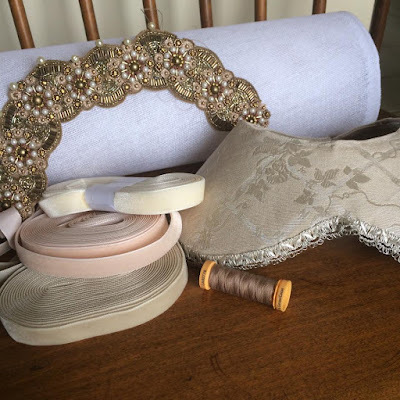 The beading or the layering of patterned fabric, lace, and transparent fabrics. I love to make new ‘textiles’ through layering or by really packing beads next to one another. The patterns and play on scale I can create really peak my interest the most. Some of the headdresses have gained a lot of popularity in the states, do you think you'll be evolving to other kinds of hats and perhaps bonnets in the future? I do! 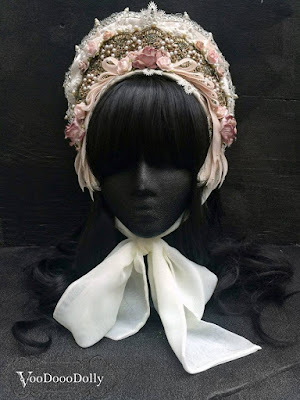 I’ve been experimenting a lot lately with more diverse buckram hat patterns and I’ve already got a few worked out J One that I’m excited about is a large brimmed Victorian-style hat with a low profile cap. The other’s are still being worked out to get the patterns juuuuuust right- but they’re almost there! 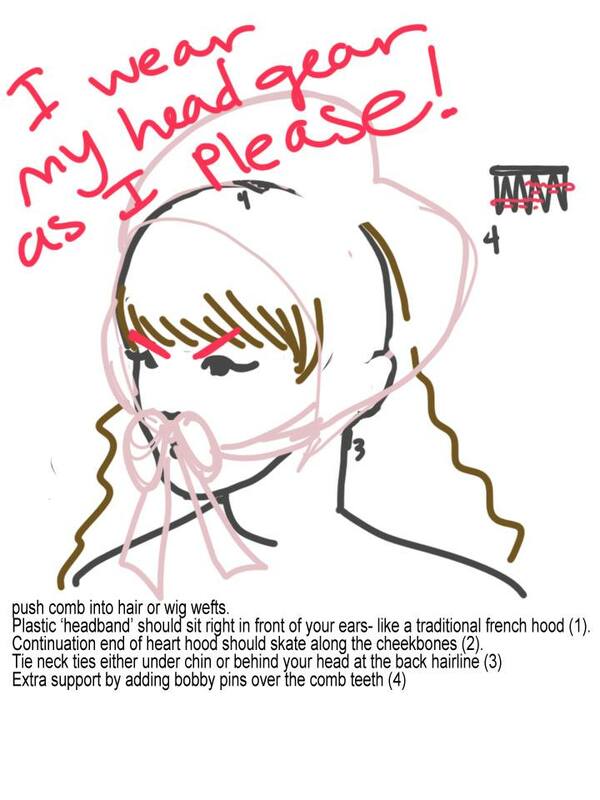 As far as bonnets are concerned, I don’t see myself making them. So many very talented people already make beautiful bonnets, so I don’t really feel like that’s a niche that needs more filling. 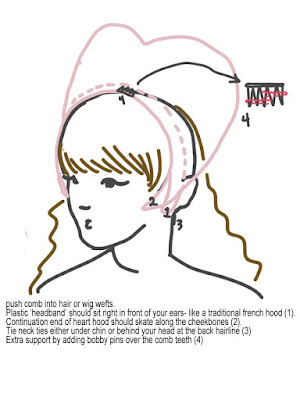 I’ll leave bonnets to the experienced bonnet pros! 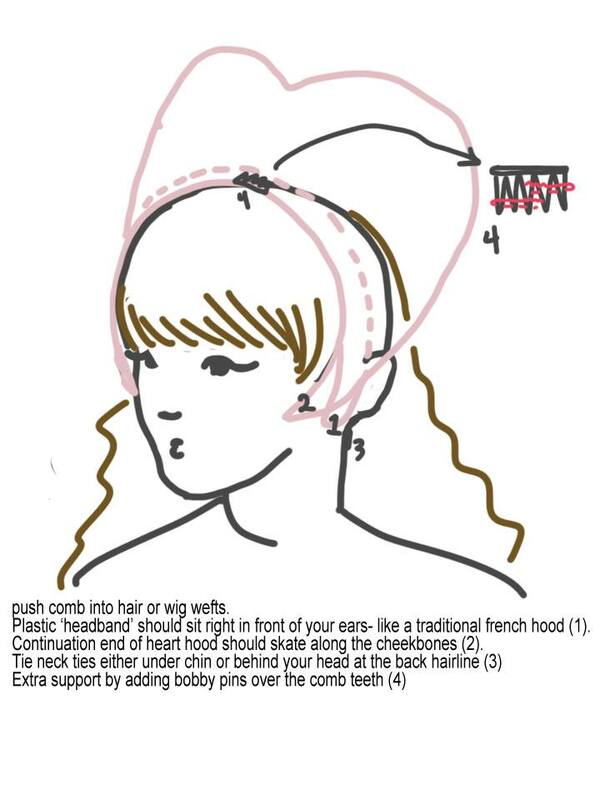 Also, my poor face looks so bad in bonnets that if I ever pattern tested them, I wouldn’t be able to tell if I’d done a good job or not!! My headdress was very similar to this test run she did in the photo pictured below. It looked perfect for a certain dress I own, Sweet Devil, and it instantly clicked that this was something I needed to get my hands on. Mallory was exceedingly helpful and provided tons of WIP photos and information. 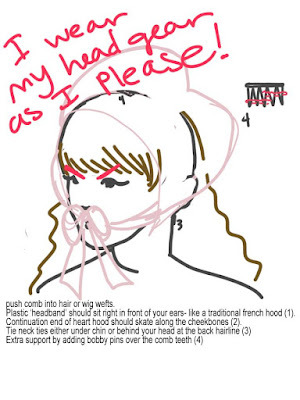 She even went as far as to give me wearing and cleaning instructions for my new piece when it arrived in the mail. The documents included these fantastic small touches like a sealed wax mark. 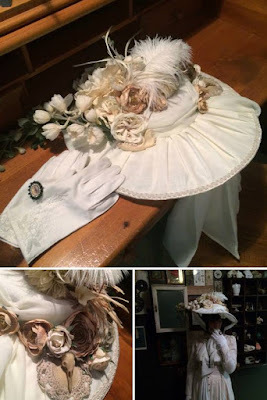 And this was a little awkward to wear at first but with some successful pinning it was a dream and as light as most bonnets I tend to wear. 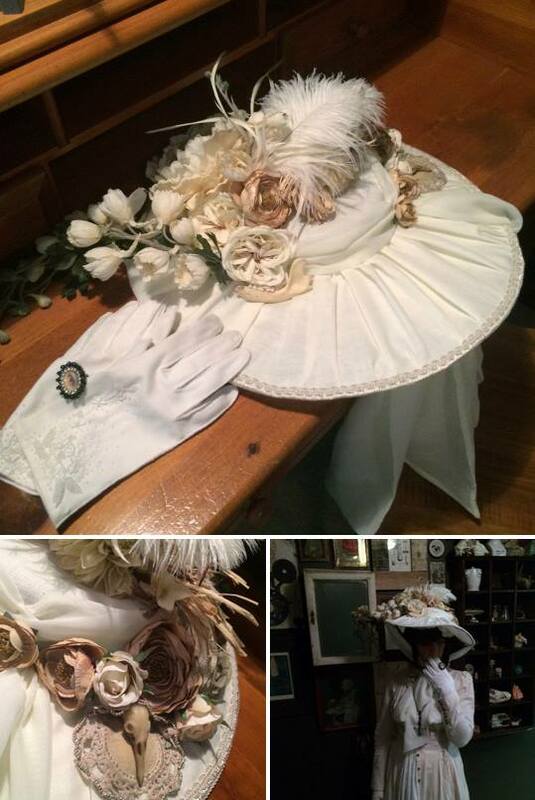 Below are some photos of the finished product of my headdress. In the first photo it looks like more of a rounded edge but it actually looks more like a heart in person. I got to wear this piece for the first time a San Japan in San Anotonio and it was a superb hit. Since then I've been patiently awaiting to obtain another to match more of my OTT pieces because they are a style all their own. It was a wonderful experience and I'd like to hope her pieces gain in popularity as the craftsmanship is extraordinary. VoodoooDolly will be vending this year at Rufflecon 2015 in Stramford, CT so please be sure to stop by her booth in the marketplace! If you can not make this event, it I would advise contacting her through her many forms of social media that can be found here: VooDooDolly. Thanks for stopping by and stay tuned I have a few more reviews u my sleeve including Baroque's new tight release collaboration with Sakizo!